With vSphere 5.1 a new component called Single-Sign-On (SSO) has been introduced. The new SSO service is mandatory since 5.1. There is no way around, you have to use it. The good thing about it is that it has various authentication options and can be deployed in an redundant fashion. Unfortunately it adds a lot of complexity to your configuration but if you understand all of it's components and functions, you won't miss it. Please note: The Use Windows session credentials / Use Windows session authentication checkbox does not work with this method as it requires kerberos which is provided by the RSA SSPI service. This service is not available when you are using VCSA. To make this button work in windows your vCenter Server has to belong to the domain you want to authenticate against. Note: Port 3268 is the global catalog. Browsing the directory is much faster when asking the global catalog. It should tell "The connection has been established successfully." Back at the Identity Source Window your AD should appear in the list and from now on you are able to assign vCenter permissions to users or groups from your active directory (As you know from vSphere 5.0 and previous). But users can't login unless you add the identity source to the default domains. You should get an warning telling you that "Having multiple domains in the Default Domain list might result in locked user accounts during authentication". That means when you have the same username with different passwords in different domains (Mostly the Administrator user in Windows) you might authenticate against the wrong directory and lock account. You AD should now appear in the bottom list. That's it. 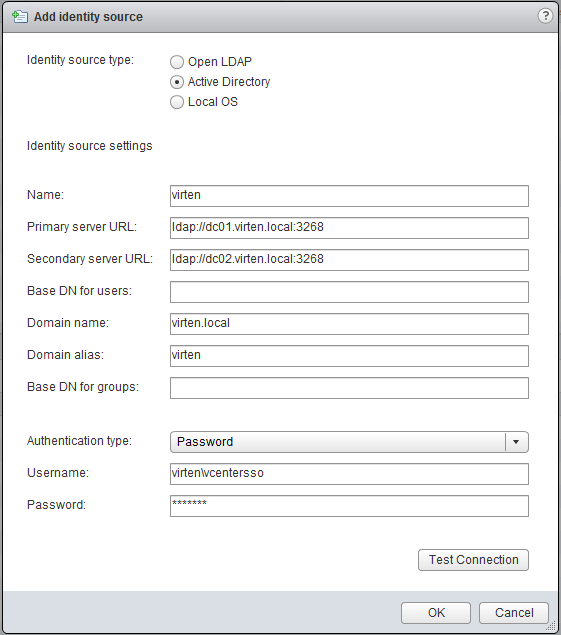 You can now set permissions and authenticate against active directory with vCenter Server 5.1 though SSO. Additional Hint: You might have noticed that you can move the default authentication source up and down. What is the best option? Where to put the active directory? The safest position for the AD authentication is the last place. This makes it unlikely that you accidently lockout yourself. If you want to authenticate without having to enter your domain (user rather than domain\user at the login-screen) you should place it on the first position to make the login process faster. Always remember to hit save after changing sso configuration! You got this error message when you try to use a specific named user for running the vCenter SSO service. Try to use the default (Local network account) instead. Thank you, this is the best write-up due to the #13's "Note" and "Additional hints" at the bottom. Finally an article to explain this as it should be explains.